Roughly break the washed spinach with hands. Quickly fry the Green Chillies in little oil , add Spinach leaves to it. There is no need to add water. Add a pinch of salt to the leaves to retain the green color. Cook for about 3 minutes and set to cool. Coarsely puree them using a Hand Blender. Meanwhile Cube the paneer and fry them in oil till golden grown on both sides and keep it aside. Heat oil in a pan. Fry the onions first and then add G-G paste. Once the raw smell goes add tomato puree, red chilli powder, Dhana-Jeera Powder, Turmeric Powder and salt. Cook them well till the oil oozes out to the ends of the pan. 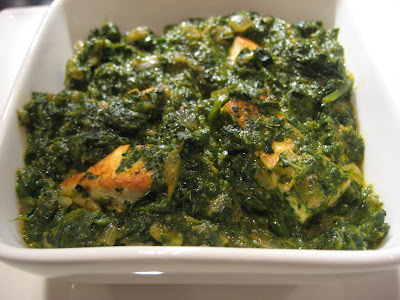 Now add the Coarsely pureed spinach to the pan and cook for few more minutes. Add the panner cubes and Half & Half(or Cream) at the end for a creamier taste. Thanks ! 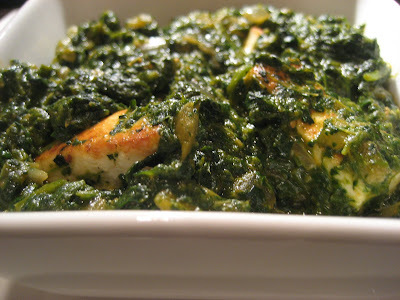 I really started to like spinach! after I tried with your receipe! A different taste! !